Car difficulties can often present themselves at the worst time possible. Dull windshield wipers fail you most in that out of nowhere storm that the meteorologist never saw heading into town. Air conditioning can quit on you on those 100 degree Summer days. Tires can pop on the highway after hitting debris causing you to panic and swerve into another lane. When it’s time for an auto repair or adjustment you can turn to Alliance Automotive. The auto speciality shop just switched gears and found themselves giving the green light to OC Designs Online to design a new custom eBay shop design. After browsing what seems like a trunk load of eBay templates the shop found the perfect layout for the store. The header to this eBay store design is sleek and stylish much like the sports car in the store logo. Online shoppers can’t miss the shop logo in the top left hand corner of the page. The store name is in a bold black font with the lettering incorporated into the body of the car. Below is a red information panel where customers can read up on the store. They can find tabs to view all of the store listings, peek at previous customer feedback and read over the store FAQs. Just in case they’re not finding what they want they can look to the right hand side for the shop search tab. The store search tab allows customers to search inquiries and products easily with the click of a button. 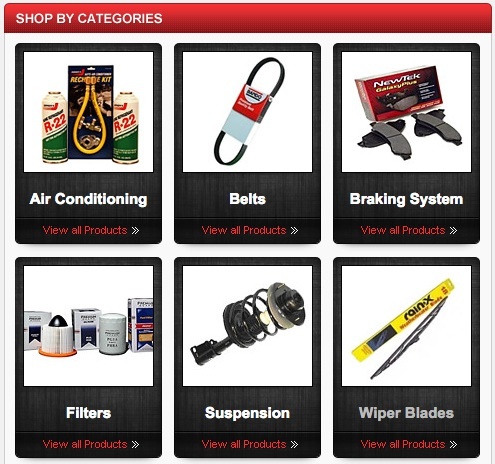 The right hand side of this eBay shop design is dedicated to featured products at Alliance Automotive. This section is great for steering customers to discounted item, new inventory or products that may be easily overlooked in the store. Each tab includes a picture of the item, a brief description and a price. If it looks like a steal or the item of the customer’s choice all they have to do is click the “Shop Now” tab to be driven in the right direction for checkout. Toward the end of this eBay store design customers can find a list of category tabs to direct customers in the right direction. There’s no navigation app needed here because OC Designs Online made it easy to find your way! Take a moment to browse our portfolio and request a free quote. You won’t be disappointed. Also, don’t forget to find us on Facebook, follow us on Twitter and check out our Google+ Page too!